I am writing you in the pleasant afterglow of a fruitful craigslist adventure which ultimately landed me walking as gracefully as Bigfoot down a hair-show runway with bubblegum pink bangs and has left me today with an envelope full of chopped locks to donate and November rent. After growing my hair for the past 5ish years without dying it, and having the intention to someday donate it, this odd job, made possible by good ol’ Craigslist, allowed all my hair donation dreams to come true. See once long hair in photo below, apologies for the selfie. Hearing some questionable feedback about Locks of Love, a prominent hair donation organization, I decided to go with Wigs 4 Kids per the suggestion of the ALOXXI hair team, the one’s responsible for my new doo and this poor model’s sore cranium. Apparently, Locks of Love, though a “non-profit,” charges some kids for their wigs, whereas Wigs 4 Kids provides all wigs at no cost, also offering services like counselling and enrichment activities to kids and their families. Also good to know, Wigs 4 Kids asks for 10” instead of 12” (what I thought I’d have to cut) and will accept hair as short as 7-9” for short hairstyled wigs. I haven’t done a ton of fact checking about the Locks of Love controversy, but since I have’t heard anything bad about Wigs 4 Kids and they had a lenient hair length, I’m gonna err on the side of caution on this one and send my tresses to this Michigan based non-profit instead of Locks of Love. In case you or anyone you know is thinking of donating hair, I thought I’d mention this subject. 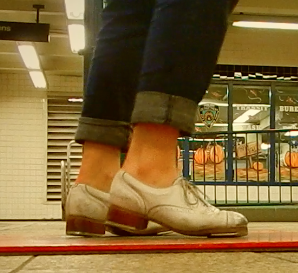 As mentioned at the start of this blog, I’m working towards somehow combining the topics of tap dance, electronic waste recycling, and ape conservation. 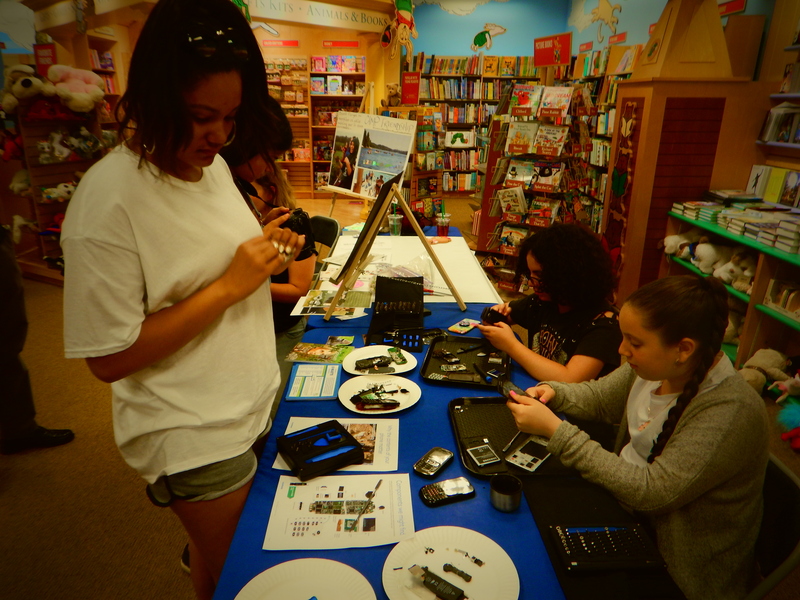 A few months ago, a little progress was made when I teamed up with a lovely lass named Emily Duda to host an Urban Mining workshop at Barnes & Noble to raise awareness of the impacts of electronics on ape habitats. Electronics are produced the expense of Chimpanzees, Gorillas, and humans living in Africa, which is not fair. 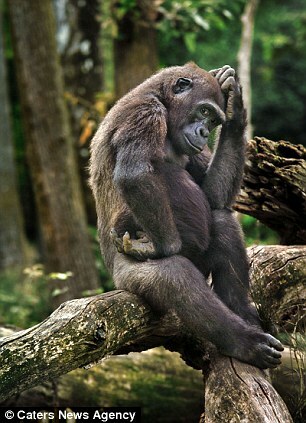 Metals inside our phones, computers, and tablets come from the parts of Africa where Chimps and Gorillas live. These habitats are being damaged through the mining process, endangering the survival of these 2 great species. People who mine these materials often work in sub-safe conditions, receiving ridiculously low wages for the work put in. Furthermore, the influx of people moving into these previosly untouched areas for work as the electronics industry grows has also paved the way for poachers to come in and snag Chimps and Gorillas for the Illegal Pet and Bushmeat trade. What can we do, those of us living far away from the conflict? Its a bit of a hassle to properly dispose of electronics these days, but its important to do so. We must work to bring balance to the force, young padawans. Though I’m not sure if electronics manufacturers are actually USING recycled materials in new products, a point brought up by a much appreciated skeptic at the workshop, the act of recycling will inevitably make the supply of recycled materials more available for manufacturers to use. 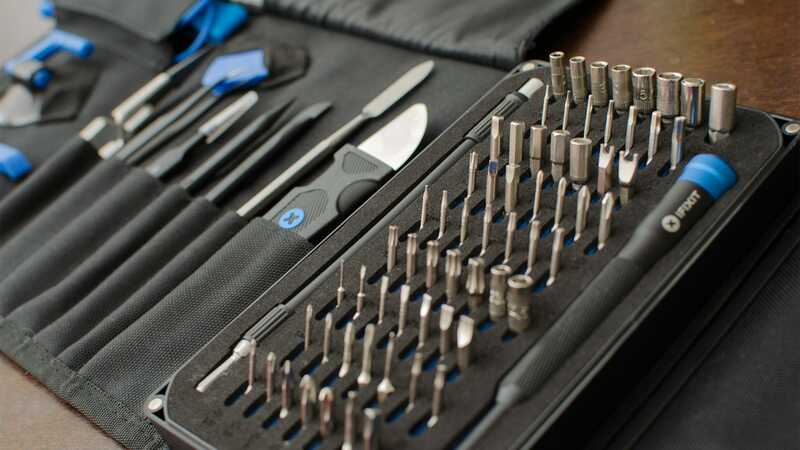 It will at least give manufacturers the option to incorporate recycled materials into new products instead of continuously importing raw materials. Hopefully as time goes on it will become easier for the consumer, me and you, to properly dispose of electronic waste. It’s a dream of mine, to live in a world like that. For now, you may need to do a little research to find out where to recycle used electronics locally, and you will likely have to take a trip to a store or recycling center to do so. If you need help figuring it out, reach out either through a comment or message on the contact page of this site and I’d be happy to help you navigate. In New York City, a pilot program has been launched to provide curbside pick-up of electronic waste upon request. I think this is very cool and hope more cities are introducing or already have similar programs. If you know anything on the subject, please share the info, thank you! 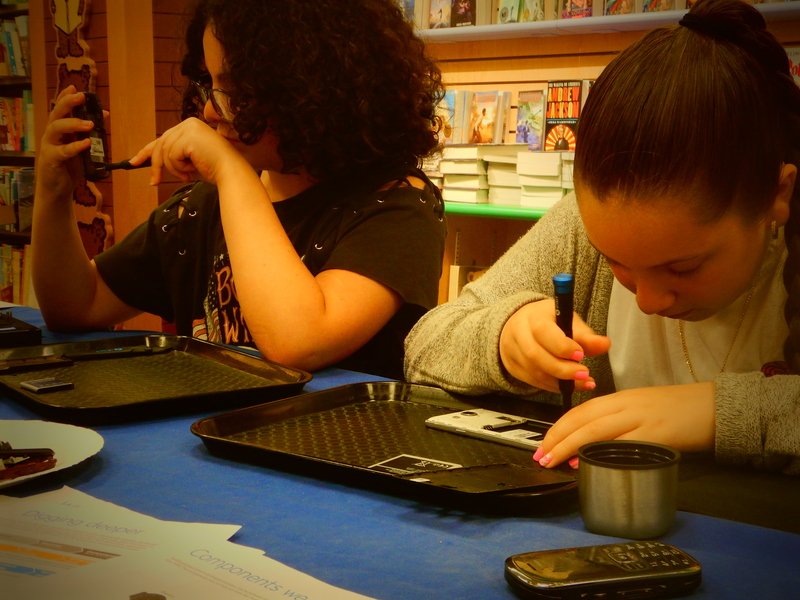 Our event was part of the Barnes & Noble Bookfair program which allowed us to fundraise in addition to reaching an audience. 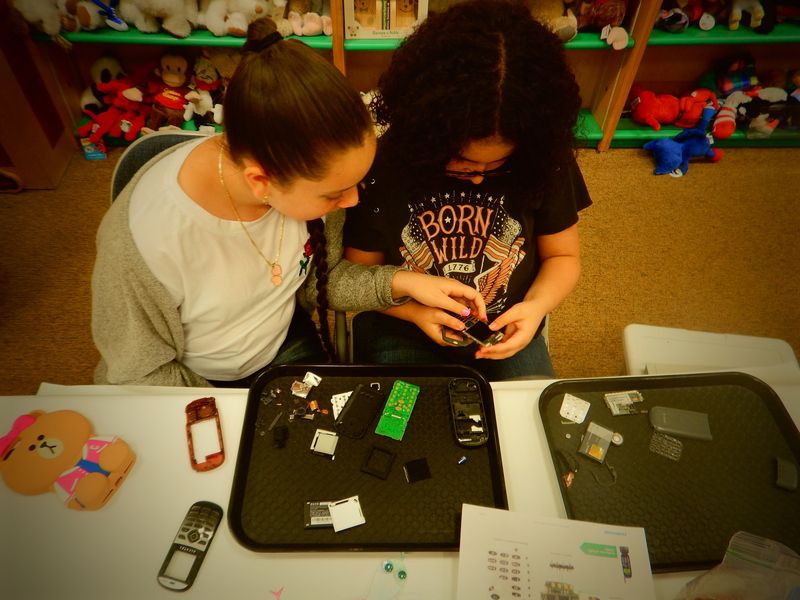 Our goal was to spread the good word about Electronic Waste Recycling and raise money for Emily’s project: Camp Friendship, an afterschool and summer program that connects city kids with nature. With a generous donation of toolkits from IFixit, a company working to reduce electronic waste by developing repair manuals and tool-kits for the lay-man, and using a workshop guide provided by FairPhone (which I’ve written about before here), we set up shop in the kids book section of Barnes and Noble and tried to engage as many people as possible in the discussion of whats inside our phones. Chimpsplaining at Barnes N’ Noble. All in all I don’t think we raised much money for either cause, but we certainly did talk to a handful of people about electronic waste recycling, whats inside phones, and where these materials come from. Hopefully the ideas will sink in to the folks we reached and from there momentum can grow. 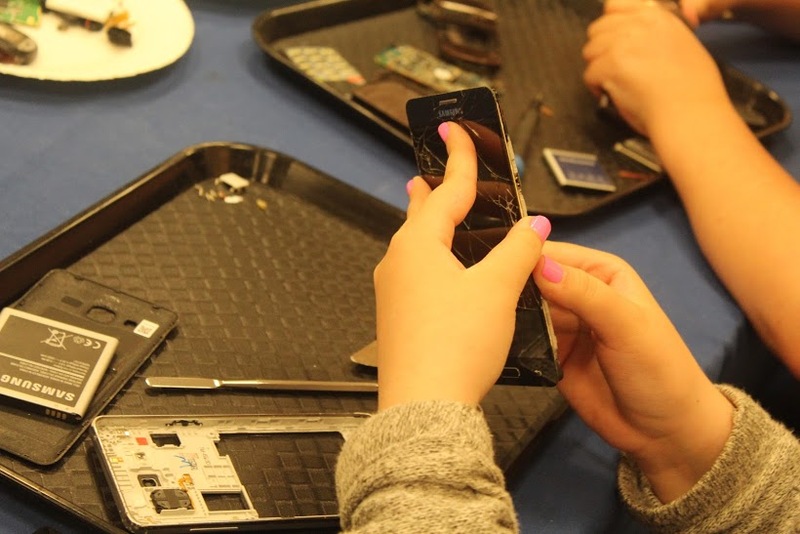 Any anyway, the kids who trickled in had a great time taking apart old phones and exploring the insides with the tiny tools donated by IFixit. 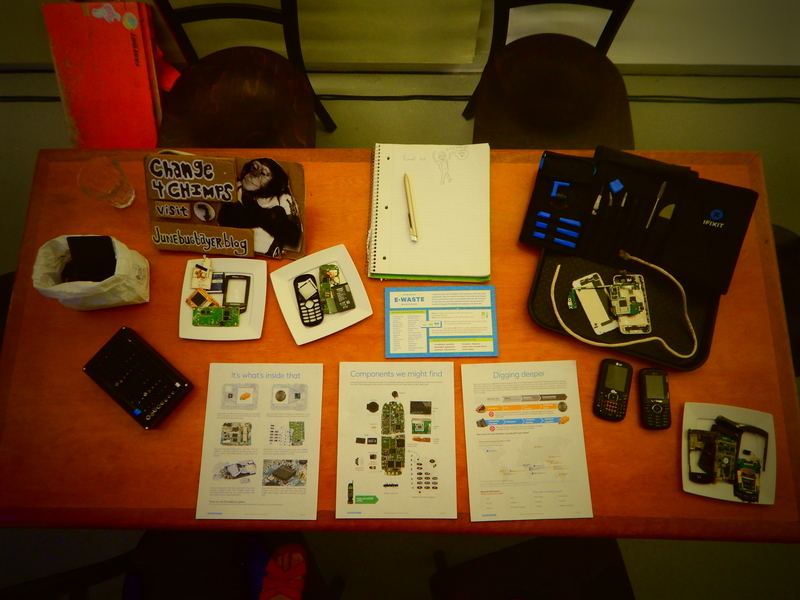 The phones used in this workshop were a combination of broken smart phones I was able to collect from my apartment building neighbors and several old school flip phones donated by the Gowanus E-waste warehouse in Brooklyn. The whole manual can be found here. 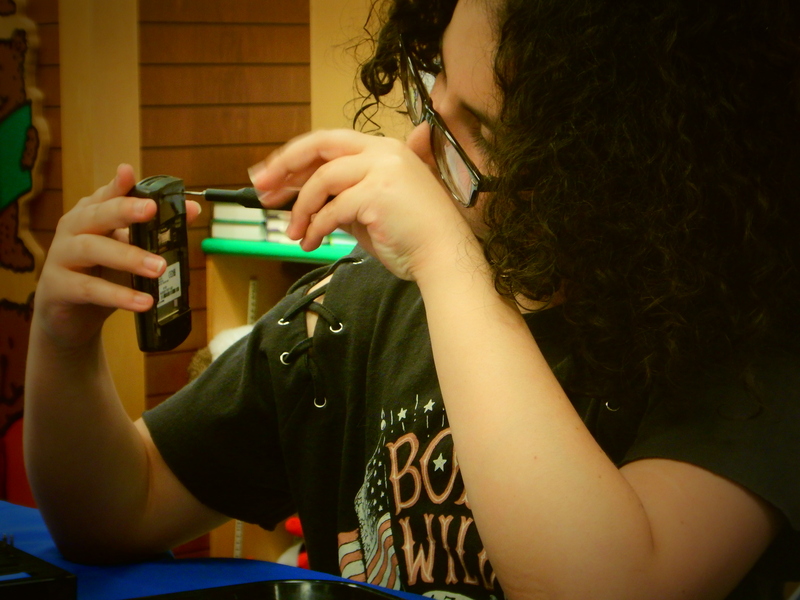 I was particularly entertained by one child who was stoked on the silicon number pads inside an old flip phone. I hadn’t thought of if before, but kids these days are missing out on the tactile element of phones because smart phones don’t have buttons, just screens. Well, thats all I’ve got for now. I’ll leave you with a little something I made out of the workshop remnants. This is fabulous, Kelly!! I am so proud that you organized this event and chimpsplained! The graphics really helped me connect the dots, tracing the metal in our phone guts to the areas of our planet that are being stripped to get those metals. Like the skeptic you mentioned, I too wonder about the recycling effort. Is there a way to find out from the phone manufacturers how much recycled metal they use? Btw, I love that *girls* were tearing apart the phones.